Abundant with mountain biking and hiking trails and white-water offerings, the Nantahala Gorge has long been heralded as an oasis of outdoor recreation. 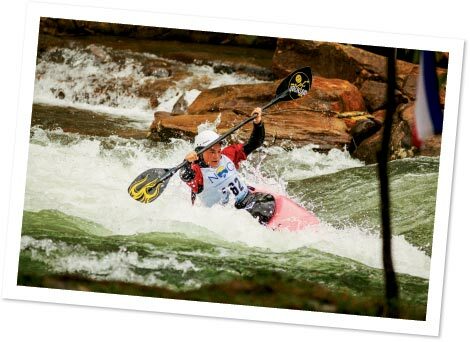 Throngs of adventurers flock here every year, but September 2-8, the Nantahala Outdoor Center will host its largest event yet, the International Canoe Federation’s Freestyle World Championships, welcoming hundreds of athletes and more than 1,000 visitors to the river. Freestyle kayaking is the competitive side of playboating, in which boaters perform acrobatic tricks within a set amount of time for a panel of judges. Spectators can get in on the thrills too by watching the competitors pull off loops, cartwheels, and more on various water features. The highlight of this event is the 2013 Wave, a concrete wave shaper designed to provide stronger jetties, increasing opportunity for complex moves. During the week, the boaters will work their way through contests to earn spots in the semifinals and finals on Saturday and Sunday. More than 300 top freestyle paddlers re expected to compete for a medal and the title of 2013 ICF Canoe Freestyle World Champion in eight classes divided by age, gender, and boat type. Locals to cheer for include Chris Singletary, a member of the 2013 National Team, and 16-year-old Rowan Stuart, who hails from nearby Stecoah. Recently, Stuart won second place in the K1 Women’s Junior Class of the USA Team Trials. “I’m stoked for the World Championships to be coming to North Carolina,” she says. “I’m excited to introduce so many international athletes to my hometown.” The rising star will be a member of the 2013 USA Canoe/Kayak Freestyle National Team. The week of events will take on a festival atmosphere with live music each night, local artisans and craft vendors, and contests on the campus of the Nantahala Outdoor Center. And if you feel the urge to get on the water yourself, rafting trips will continue to operate upstream. There won’t be acrobatics involved, but plenty of excitement is guaranteed.